Credit: Merel Soons et al. Plants cannot move to find new places to live in, but they can actively direct their seeds to new suitable places for plant development. This 'directed dispersal' had previously been shown only for plants with seeds that are transported by animals. Researchers have now shown that plants can also actively send their seeds towards suitable sites by way of wind or water. The results from the study, led by Utrecht University biologist Merel Soons, is published Early Online in Functional Ecology on 14 October. Whereas directed dispersal has been known for animal-dispersed plant species, most plant species are not dispersed by animals but by water or wind. "I wondered: wouldn't it be highly efficient for these species as well, if their seeds were dispersed predominantly towards suitable sites?" says Merel Soons, lead author of the publication. 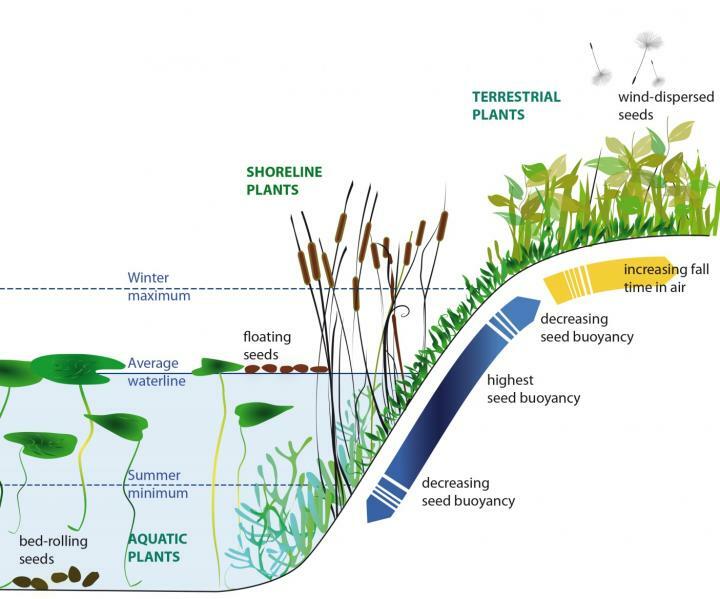 Together with her research team, she studied a range of wetland plant species growing in the water, on shorelines, and on the permanently dry, upland part. "We were excited to discover that these plants can direct their own seeds via wind or water," says Soons. "It appears that plants are really quite 'smart'."